Elephant paths: Wider methodological transparency is needed for legal scholarship to thrive. Mariana Gkliati calls for a reconsideration of traditional research methods in legal studies and how these methods are communicated. Most legal scholars seek to fit their conceptual analysis into narrow and strictly legal boxes, often relying on tacit knowledge from the field. Drawing on the metaphor of elephant paths, or an overlaying system for going from place to place, and behavioural psychology, she provides three ways legal scholars can better signpost methodological decisions to readers. According to conventional wisdom among legal scholars, legal methodology is so obvious that it does not need to be discussed. Methodology sections of books and journal articles refer to the infamous elephant path, as the route that everyone else before us has taken, suggesting that it would be stating the obvious if the author were to describe their research methods with anything more than ‘traditional legal research’ or ‘desk research’. But can you still recognise the elephant path, if you’ve never seen an elephant before? Although it may be obvious to legal scholars, to the untrained eye there often seems to be a lack of any methodology, which disqualifies the academic value of the legal discipline compared to other social sciences and has significant consequences with respect to the allocation of funds. This definition comfortably fits within the legal research paradigm. Here as well, an elephant path has been shaped throughout the development of the legal discipline by researchers moving in the space of a certain field of law, going from their initial assumption to their final research outcome. What is important to realise is that there is not just one single elephant path. The elephant path is merely a verbal construction that helps us describe the established process of accessing a destination. In practice, there are as many urban elephant paths as there are people going to their usual destination, and there are as many legal research elephant paths as there are research projects. These paths are connected to the ‘streets and architectural forms’ or, in other words, the conventions of the legal discipline. They still constitute, however, an unofficial route, since in research one can arrive at the same conclusion using different paths, i.e. research methods. But what is also true is that a different path may lead to a different conclusion. Even in traditional legal methodology there are different choices to be made. Why was a particular legal instrument chosen for the normative assessment? Why was a topic of EU law studied within the international legal framework? Why was a dynamic interpretation chosen over the will of the drafters? Therefore, even in the traditional elephant path, if I may dishonestly borrow a metaphor from psychology, you need to ‘direct the rider, motivate the elephant, and shape the path’. 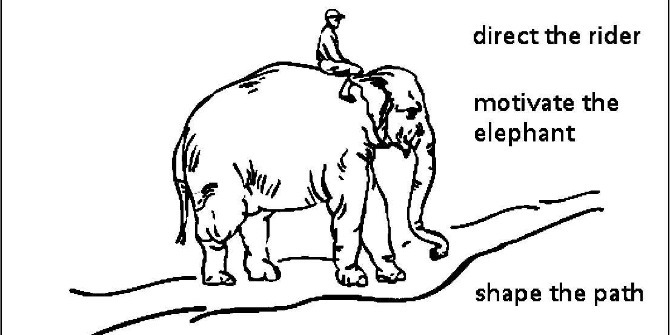 Direct the rider: The author directs the reader-rider of the elephant from early on, so that she will be able to find her way in the particular normative environment. This general direction is provided with the description of the theoretical and methodological framework, within which the research is situated. At this level the author may engage in discussions ranging from the methods of interpretation and argumentation, to the preferred theory of truth. Motivate the elephant: The important methodological choices are made explicit and are clearly justified. Only then can the method-elephant be assessed as to whether it is consistent and reliable. The goals and motivations of methodological choices should not remain hidden from the critical reader. After all, a battle is only fair when there is equality of arms. Shape the path: The reader is guided through the course of the research with all the steps documented in detail in the citations and endnotes, as well as with a clear argumentation structure. Only when all three points have been addressed can the reader follow and question the research path, and can legal research claim to be using a scientific method. The interaction of law with other disciplines, either because of the growing demand for interdisciplinary cooperation or because of the competition for funds, has raised awareness within Law Schools regarding the need for methodological transparency. Law can benefit even more from the work of other disciplines in respect to both, alternative perspectives and research tools. Yet most legal scholars seek to fit their conceptual analysis into narrow and strictly legal boxes. It has become obvious that as long as legal scholars keep reading only legal books and Commission White Papers, the discipline is doomed to learn only from itself and never from the others. This piece originally appeared on the Leiden Law Blog under the title, Traditional legal methodology: What if you have never seen an elephant before? and is reposted with the author’s permission. Mariana Gkliati is a PhD candidate at the Institute of Immigration Law of Leiden University. She specializes in human rights protection in Europe and European Migration Law. Her doctoral research focuses on the legal protection of individuals against human rights violations in the area of asylum and immigration attributed to EU agencies, in particular Frontex. Her work experience is shared among Vienna, Athens, and Leiden. She has previously worked at the EU Fundamental Rights Agency in the area of asylum, migration, and borders and as a legal case reporter and commentator for Oxford Reports on International Law database. In her early carrier she has worked as a journalist and assisted voluntarily the NGO AITIMA, which provides legal and social aid to asylum seekers and refugees.